Here's a light-hearted quiz I prepared covering the last year or so on Birmingham 13, Moseley's premier neighbourhood magazine. Literature: Which famous writer was born locally and based his bestselling books about the quest for an item of jewellery? History: What date was shown on the cover of the August edition of Birmingham 13? Spelling: What is the correct spelling of the name of the famous local man exclusively interviewed in the April issue of Birmingham 13? Current affairs: Which anti- social driver did I criticise in my piece Colonel Moseley Returns? Celebrity: Who was profiled in the first of my occasional series Brummie Heroes? 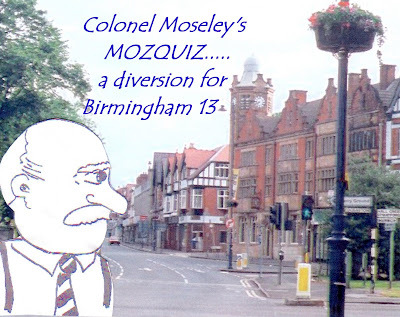 Geography: Which thoroughfares in Moseley past and present have not been contrasted in recent issues of Birmingham 13? Botany: What is the correct name of the campaign which funds the floral display in the Village and other work? More celebrity: Who was extensively featured at the Moseley Garden Party in a questionable striped shirt and improbable hat, clutching tongs and fork? Between 0 and 7: Isn’t possible - but you may have a career as a government statistician or in local politics. Between 8 and 12: You are either wilfully ill-informed or a bit silly. Alternatively you may be above quizzes and consider your score is ironic in a wry, post-modern sort of way...sadly, we shall never know. Between 18 and 24: You are a worldly-wise Moseleyite with an impressive grounding in history, geography, celebrity-culture and even spelling. Your towering intellect and erudition suit you to write for Birmingham 13. Ever thought of trying? Go on, give it a go!